Listen to the album Houlding it Together here. The inspiration for this album came from so many memorable collaborations with colleagues, all of whom demonstrate superlative qualities as teachers, performers but above all friends. Recorded at various locations around the globe over the last ten years I hope you enjoy the breadth of diversity and style represented here. 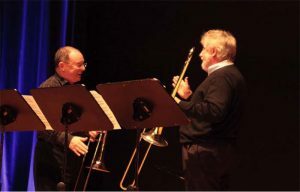 Well known British trombonist and composer, Simon Wills created the first chapter of this compilation for Joe and me to premier at the Alessi Summer Seminar in New York in 2001. The title Bujole, is formulated by rearranging the letters JOE and ULB. 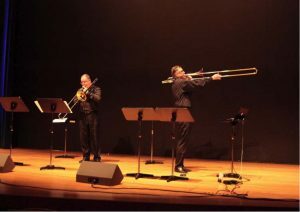 JOE for Joseph Alessi and ULB, an ‘affectionate’ nick name acquired by myself courtesy of a much respected doyen of the bass trombone world and standing for Ugly Little B****** (what charming traditions we have in the music business!). Having performed it a number of times we recorded this version at the Royal Northern College of Music, Manchester in April 2006. The Three Emily Dickinson Songs were introduced to me by ‘larger than life’ US teacher and performer, Don Lucas during a visit to Texas Technical University in the late 1990s. Originally composed for female chorus we subsequently recorded these beautiful pieces arranged for two trombones and piano in London’s magnificent Henry Wood Hall in Autumn 2007. 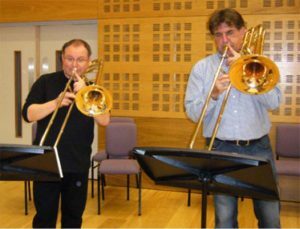 Dutch jazz trombonist and composer, Ilja Reijngoud was commissioned to write a new solo piece for Ben van Dijk to play with the Yorkshire Imperial David Urqhuart Brass Band at the International Trombone Festival in Birmingham in 2006 with me conducting. 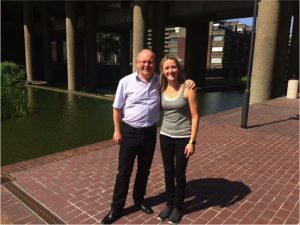 As a result I asked Ilja to write us a duet which we premiered and recorded at the RNCM in Manchester during the period Ben was International Visiting Chair in Trombone in February 2009. 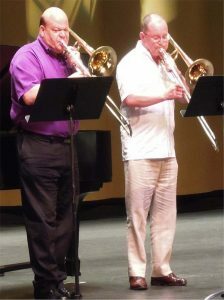 Having guided Brass Band star trombonist, Brett Baker through his Masters Degree in Manchester it seemed only natural to collaborate on a duet when we found ourselves sharing the bill at a concert as part of the International Trombone Festival in Las Vegas in 2007. Well known band composer, Peter Meechan produced this tuneful and descriptive work evoking the flavours of central America for the occasion. This recording was made in Peel Hall, Salford University in August 2015. 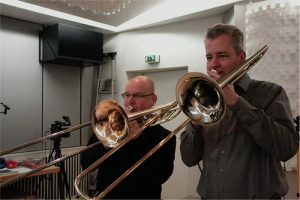 Pitched in the key of D this quirky little workout was composed by Jazz Trombone Professor and colleague at the Folkwang University of Arts, Essen, Ansgar Striepens. We recorded this in the Folkwang University recording studio in September 2013. 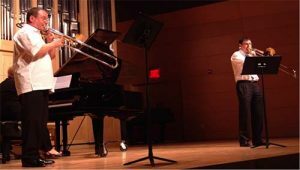 One of my more illustrious former students has carved out for herself a tremendously wide ranging career encompassing the worlds of Pop, Jazz, Classical and Editorial so I set about creating something unique for us to play together. 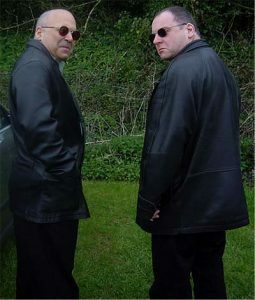 Scored for two trombones, piano and bongos, this three movement work is entitled Mr. Purcell’s Masque based on themes from Henry Purcell’s Dioclesian and was recored in Manchester in July 2013. The final track features world renowned trombonist, band leader and educationalist Jiggs Whigham doing what he does best. What a treat to play alongside this master of ‘melody and impro’. A highly entertaining video of the complete recording session made in Essen in October 2013 can be found in the ‘Members Only’ section of the ITA Website. I was so lucky to have Someone (like Jiggs) to Watch Over ME !